Validation policy for stop-and-wait command Interests. This policy checks the timestamp field of a stop-and-wait command Interest. Signed Interest validation and Data validation requests are delegated to an inner policy. Definition at line 42 of file validation-policy-command-interest.hpp. Definition at line 28 of file validation-policy-command-interest.cpp. 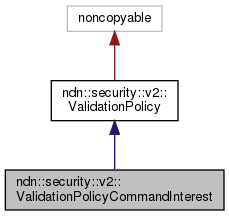 Definition at line 43 of file validation-policy-command-interest.cpp. Definition at line 50 of file validation-policy-command-interest.cpp.